So you have been having trouble drawing faces. Drawing the eye's and nose can be extremely tough. Matt struggled for many years working as an illustrator, especially in the beginning when he had to paint realistic faces for bookcovers. 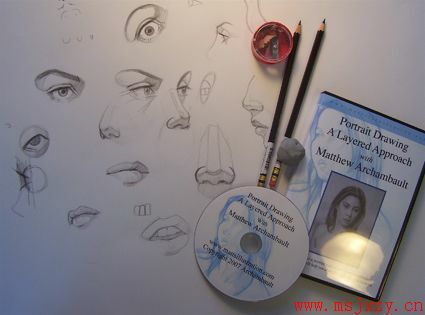 Matt created this DVD to help you conquer the obstacle of Drawing a portrait so you can create your own beautiful art and be happy with the results. The actual running time for this DVD is two hours long. 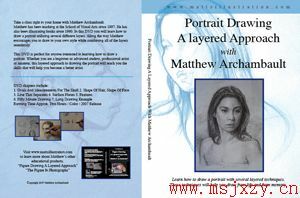 Matthew walks you through his layered approach for drawing a portrait. The first few chapters of the DVD will teach you how to draw a sculpted three dimenional head. The mid portion of the DVD gets into all of the good stuff you have been looking for, like how to draw features. Matthew teaches you how to draw the eyes, the mouth, and the nose. In the final chapter Matthew pulls all of the techniques together into a fifty minute drawing. This DVD teaches you how to draw from life as well as from your memory. "Portrait Drawing A Layered Approach" works great for illustrators, animators, as well as comic book artist. Basically anyone who needs to learn how to draw the portrait in a realistic way. Matthew ships his DVD's globally to just about any destination. Each DVD can play both on your computer or DVD player. Copyright 2017-2019 Powered by MS935.com，美术教学资源网 All Rights Reserved.